Avoidable hospital deaths – who is really to blame? So Fiona Godlee, editor of the British Medical Journal, has at last written to Jeremy Hunt accusing him of “publicly misrepresent(ing) an academic article printed in the BMJ”. She referred to the Freemantle paper which clearly demonstrated a statistical excess of deaths in patients admitted to hospitals over the weekends but which did not conclusively identify the cause. She said that “Despite the authors’ very clear statements (that the data did not indicate a the cause) in the paper and elsewhere, you (Jeremy Hunt) have repeatedly told MPs and the public via media interviews that these deaths were due to poor staffing at weekends, with particular emphasis on medical staffing. This clearly implies that you believe that these excess deaths are avoidable”. Godlee is not the first to point out his overegging of the evidence. There are dozens of rapid responses printed alongside the paper in the BMJ (including my own) which say pretty much the same thing. Causality cannot be determined from this study and to imply that it can for political purposed is dishonest and potentially harmful. Earlier this week two academic doctors wrote to the cabinet office asking it to investigate Hunt’s claim that the 11,000 deaths were due to too few doctors being on duty. They alleged that that he had breached the ministerial code of conduct by misrepresenting official statistics. The letter was signed by thousands of fellow doctors. I know from personal contacts in the Department of Health and elsewhere that Mr Hunt has been briefed, is well aware of these concerns and understands the issues completely, yet he has continued to make the same unfounded claims. So it appears highly likely that Mr Hunt has indeed deliberately attempted to mislead the public about weekend death rates, which begs a crucial question. Why has he felt it necessary to do this? This question should be considered with reference the wider context of what has happened to the NHS in recent months. The NHS is under considerable pressure at the moment. Staff morale is low, finances are stretched to breaking point and demand for services is increasing. Disgruntled doctors have taken to the streets. More than 30 acute trusts have not been able to recruit a permanent CEO. Many have predicted a very difficult winter ahead with the potential for significant service failures. In these circumstances one might expect a responsible government to take a lead on emergency contingency planning, identifying and plugging funding gaps and taking actions to encourage recruitment and retention of staff. This has not happened. There is no central winter emergency plan – that has been delegated to the regions. (I know about the Cold Weather Plan which is about wearing a thicker pullover and is different). There is no attempt to help or financially bail out “failing” trusts, despite the fact that money is available. Putting trusts into special measures and walking away is unlikely to help the situation. Picking public fights with junior and senior medical staff by threatening to unilaterally impose Draconian changes in terms and conditions is deeply unhelpful. Promising the public an elective 7 day service when there is clearly insufficient money to operate the current system, threatening to deport overseas nurses, capping spend on agency nurses regardless of whether they are essential for safety, going back on safe ward staffing level recommendations, the list goes on. 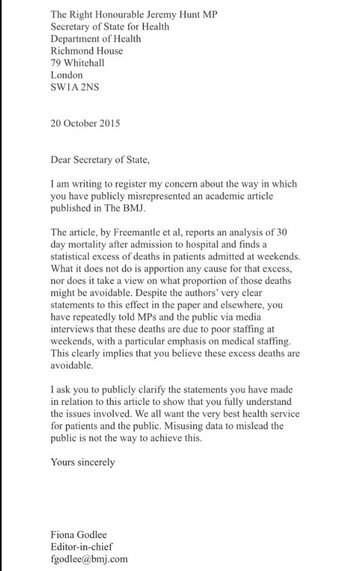 So why has Jeremy Hunt found it necessary to try to deceive parliament and the public about weekend mortality? When taken in the wider context one can only speculate on his motives for doing these things. It could be that he does not have the insight to realise that these scare stories cause real distress for real patients and staff and does not appreciate the harm he is doing. Only he can say why he has done what he has done and perhaps he should be asked formally. In a sense the reason for his actions is unimportant – it is the consequences of his actions that matter. When there is a major disaster such as a train crash and people are killed the investigation quite rightly looks at the senior management in charge of the service and if they are found lacking they may be vulnerable to prosecution on charges of corporate manslaughter. If acute front door services in a major trust fail completely this winter it will be just as serious and potentially just as deadly as a major train crash. I don’t know if the law on corporate manslaughter applies in the NHS or indeed even if such a catastrophe would trigger an independent investigation. We all accept that it is so likely to happen that it will probably not even make the news headlines. When emergency services are starved of funds and staff, stretched to the limit, abused and abandoned then mistakes are likely to occur and patients are likely to come to harm. Perhaps now is the right time to have a grown up, rational debate on avoidable deaths, their root causes, and the potential effective solutions – and to identify who is really to blame.